Do you see light or darkness? I saw this page on Matzav. There is a nice video there that is worth watching. Soldiers in Israel’s Navy who set sail last week on a mission to stop an alleged Iranian weapons shipment from reaching Gaza terrorists celebrated Shabbos together by singing Shalom Aleichem and then making Kiddush and having a seudah. The members of elite naval commando unit Shayetet 13 gathered below deck to sing together. The soldiers, who mostly wore yarmulkas, put their arms around each other’s shoulders and swayed back and forth as they prayed. After the song was over, one soldier stepped forward and made Kiddush. Days later, the unit successfully intercepted the arms shipment in the Red Sea. The boat, named KLOSC, was headed to Sudan, 1,500 miles from Israel. One of the weapons captured, the M-302 missile, is made in Syria and is based on Iranian technology, Israel’s Walla reported. IDF Chief of Staff, Lieutenant General Benny Gantz, oversaw the operation and gave the order to Major General Ram Rothberg, head of the Israeli Navy, to seize the KLOSC, the IDF said earlier this week. What upset me were the comments section. The various commentators bemoaned the possibility that the video was taken on Shabbos, the last comment though captured how I felt. I didn’t even remotely think for one minute that it was taken on Shabbos. It looked pretty light to me, and it was entirely possible one person hadn’t been mekabel shabbos and took the video because he was so proud of the scene. then this video is an Open Psak that they are wrong, wronger, and wrongest, but all they feel is that they are wronged. Even הכרת הטוב doesn’t enter their vernacular. Wasn’t this video likely taken by a Yid on Shabbos? Are you allowed to watch something that came through Chillul Shabbos?! This video makes me so sad. Why do you publicize a video made with chilul Shabb-os? A video created on Shabboss is Maaseh Shabbos & shouldn’t be shown on a Frum Site! Also am I seeing things? Is the MeKadesh Hashabbos really NOT wearing a yarmulke? I agree with all above (going on shabbos for pikuach nefesh etc), except for the guy doing the videoing! was chilul Shabbos involved in taking this video? Interesting…and heartwarming. Not too often do you get to see Shabbos videos! Are we enjoying something that came about through chilul shabbos? beautiful. Who took the video? We are an amazing people! The video, however, may represent chillul Shabbos. Why would I want to watch it? Takeh, very nice. The Shaile is, who took the video on Shabbos? I’d like to point out this video was taken on Shabbos! I’m glad they sang Shalom Aleichem, but did they have to be michalel Shabbos by filming it? Even though they filmed it, they are still considered tinokim venishba and their effort to recognize Shabbos gave Hashem tremendous nochas. In addition, no matter what anyone thinks about the IDF, they are holy people because they are putting their lives on the line to keep EY safe from our enemies with G-d’s help. Yasher Koach to Commentors no 1 & 5 who see the beauty in other Jews and ignoring the chisronos; 2-4 have what to work on; we all have warts and pimples!!!.. . I daven for the day that the Jewish world will be filled with more people like 1 & 5..
Maybe it was a Druze soldier who took video. To all you cynics, take a chill pill. Instead of knocking them, see the good in their actions. Try to emulate the Berditchever Rebbe who saw only the good in each Jewish neshoma. May the IDF continue to watch over Eretz HaKodesh with strength. Author pitputimPosted on March 10, 2014 Categories Agudas Yisrael, Ahavas Yisrael, Groups, Halacha, Litvaks, Medinat YisraelTags IDF, kiddush hashem, Shabbos, Shalom Aleichem8 Comments on Do you see light or darkness? I applaud R’ Metzger for this initiative, although, I believe that this was originally the journey undertaken by Rav Kook ז’ל in 1913. Bridging gaps is efficacious; spitting and sending to the back of the bus, breeds resentment. Just to name drop, R’ Metzger sat a few rows behind me at Kerem B’Yavneh, although he was in fifth year, as I recall. The story is told of how Rav Kook, upon one of his visits to an anti-religious kibbutz, was approached by one of the leaders who greeted him as follows: “With all due respect Rabbi, you shouldn’t waste your time trying to convince us to be religious. It’s not that we don’t know what Torah is, most of us were raised in observant homes. We know Torah, rabbis, mitzvot and we don’t like them!” Rav Kook questioned,”Why?” The kibbutznik replied: “We simply can’t stand your old-fashioned, meaningless, outdated rituals!” Exclaimed Rav Kook, “I agree”. “What?”, asked the surprised rebel. Explained the Rav, “I also hate the “religion” that you describe. But the dynamic, idealistic and deep Torah is so beautiful that anyone who is exposed to it cannot but love it!”. Fanatic: refers to persons showing more than ordinary support for, adherence to, or interest in a cause, point of view, or activity. Zealot: stresses vigorous, aggressive support for or opposition to a plan or ideal and suggests a combative stance. Taking stance that is “not the norm” can be viewed as extremist. In a community of meat-eaters, a vegetarian who is uncompromising may be seen as adhering to an extremist view. Once a community comprises more vegetarians, they cease to be called fanatics. Their behaviour becomes an acceptable norm, albeit of a minority view. In either case, some vegetarians are more vocal than others. We accept the views of someone who is passionate about their vegetarianism. We don’t have a problem with the existence of vegetarian-only restaurants. There are lines, though. Where does society draw those lines? It would be unacceptable to enter a vegetarian restaurant and demand to eat meat. It would be unacceptable to enter a meat restaurant and demand that they cease serving meat. Why is it unacceptable? Simply because we recognise the right of free choice: an inalienable right; a God-given right. Free choice is the basis of our existence as humans and is the eco-system through which we are able to rise or fall. Kosher-style restaurants or take-aways are not kosher. It is forbidden by Halacha to eat food prepared in such establishments. Yet, some people on the fringe, do so. You find yourself in an environment where Kosher-style is presented to you. The food is unacceptable and yet your host insists that you partake. They cannot understand what is wrong. There is no pork. It’s supposedly a kosher fish with side salad. What can be wrong with the dressing? You decline. Your host may well be upset, yet you may not be in a position to adequately explain why you cannot take part. Your host may not be in a position to understand or accept your stance. It would be wrong for your host to become angry. Equally, it would be wrong for you to show anger towards your host. There is a gap between your views and theirs. You may also both be somewhat fanatical in your views. You may not understand each other. You may both even be somewhat fanatical in not accepting or understanding the rationale; but there is still a line. This line is the glue which keeps society together. When that line is crossed, we are in danger of falling apart as a unit. The line is crossed when someone is a zealot. You become a zealot when you take an aggressive or combative stance. This list is not exhaustive. Clearly, there are many other things that have the potential to both sully or exalt respect for the practice of Judaism. The resultant potential love of Heaven is induced thereby. The greater test is to stay an honourable, practicing and believing Jew during one’s life. As incredible as Isaac’s preparedness to allow himself to be sacrificed by his father, Abraham, the test for Abraham, who would have had to live with what he did for the rest of his life, was greater. The test to go on living is usually protracted and far more stressful. Similarly,causing God’s name and Judaism to be loved by one’s actions is greater and more challenging through the mode of one’s life and the way one lives. one does not ask a woman to move to the back of the bus, whether she is dressed according to one’s own acceptable levels of modesty or not. one does not compare Jews to Nazis—ever. To be sure, the anti-Zionist zealots, comprising so-called Sikrikim, Neturei Karta, Toldos Aaron and the others believe that they are “defending” God’s honour. They are, of course, wrong. Their behaviour is nothing short of odious and against Halacha. These zealots do not act alone. They receive the silent, or “behind closed doors” blessings of their Rabbinic leaders. They will not listen to anyone; we are all Treyf. In their mind, they have a complete mortgage on the truth. We must recognise that there is a sizeable number of “black hats” and “thick stocking” style people, who are also disgusted by this thuggish minority of misguided individuals. We must ask our own Rabbis, yes, each and every one of them, to explicitly make a statement in writing and in sermons to their congregations rejecting the ideology of the zealots as outside the pale of normative Judaism. Statements should be without prevarication. There is no need to speak about anything else. For example, the statement by the RCA is sensibly crafted, whereas the one from the Aguda is disingenuous. There is a group in our own community, constituting a section of Adass Israel Congregation, who fully agree with the philosophy of the zealots. A few days ago, I was accosted in the street, next door to my parents’ house, by a brain-washed boy , who yelled at the top of his lungs “Zionists are Pigs” (in Yiddish). Do not forget that this group of zealots are in our midst. Pockets exist in most Jewish communities around the world. 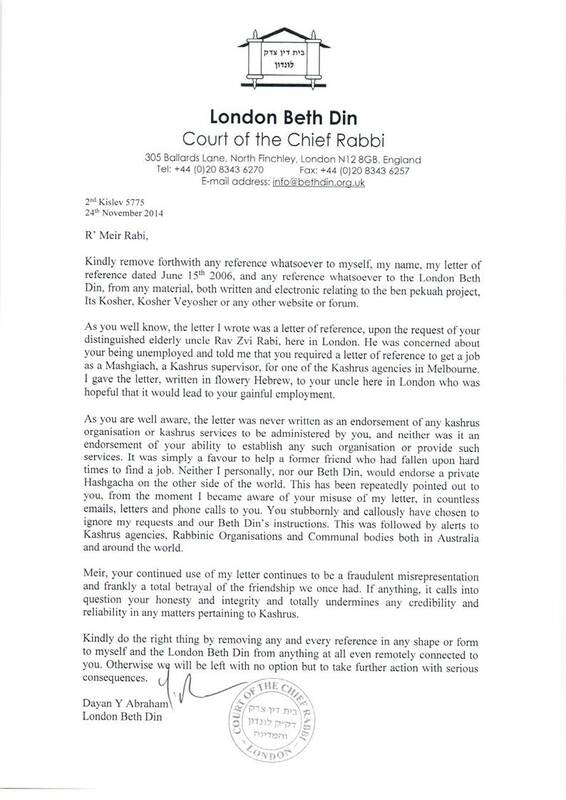 When asking for a statement/response from your Rabbi, it is important to not only include members of the Rabbinic Council of Victoria or the Organisation of Rabbis of Australia. One should also approach the Rabbis of Adass, Beth HaTalmud and other non-affiliated congregations and ask specific questions with no wriggle room. In particular, ask if it is ever appropriate to demand that a woman “move to the back of the bus” even if she is on one of those bus lines where such an pseudo-mechitza is implemented. When a collector comes to your door, ask them the same question. If you don’t like their answers, give them less and someone else more. Avoid apologetics. There is absolutely no justification for this disgraceful anti-halachic behaviour. Let me end with a story about a true sage, R’ Shlomo Zalman Auerbach ז’ל. In his neighbourhood of Sha’arei Chesed a lady persisted in driving through the otherwise empty streets on Shabbos. Surrounded by the “holy” ones, he was asked, “Surely you have a Torah obligation to protest against this desecration of Shabbos?”. R’ Shlomo Zalman responded that indeed he did have a responsibility to express his dislike for what was occurring. He advised them, however, that throwing stones, or surrounding/blocking the car and/or yelling “Shabbos” achieved nothing. It only served to further aggravate the situation. “So in what way are you protesting?” they asked. R” Shlomo Zalman was quiet. Over the next few weeks, rather than accosting the women who drove through the neighbourhood, they observed R’ Shlomo Zalman as he walked in the street after Shule and came face to face with the car. A look of genuine pain was seen on his face. The lady noticed this look from R’ Shlomo Zalman’s face over the next few weeks, and apparently decided that she didn’t want to cause any angst to this old and pious man. If you are respectful to people, they will also respect you. Don’t cross lines. We Jews who also try to keep Halacha to the best of our ability must vehemently reject and ostracise this group of unsound zealots and let them know that we are not with them in any shape or form, and that their corrupt version of Judaism is simply an invalid aberration.